Make a reservation deposit for your trip below. The Midnight Sun Angler Package Includes: The scenic round trip flight from Anchorage to Wildman Lodge, two fly out fishing days and four days of guided fishing via jet boat on Alaska’s only true artesian sport fishing river system for salmon, trout and Arctic char. The lodge furnishes spin fishing gear and fly fishing equipment is available for rent. 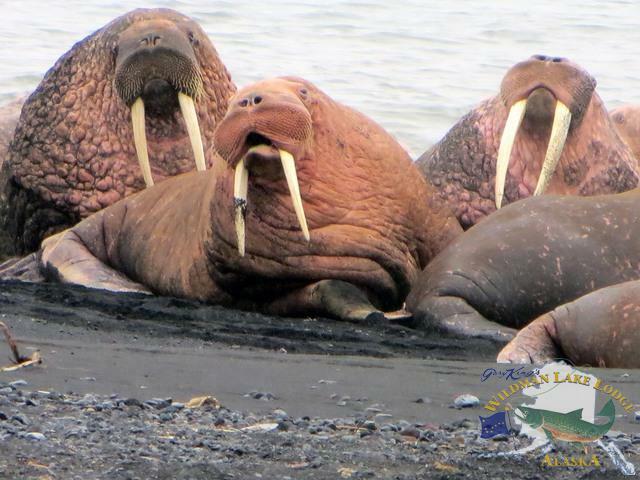 Our famous ‘Wildman Walrus Tour’ is a an optional excursion. Enjoy superb cuisine and clean, comfortable accommodations in well appointed guest cabins, each bathroom has a piping hot shower. You have a choice of either twin beds or king bedrooms for couples. Family cabins are available during select family fishing weeks this summer. In the spirit of conservation we catch and release our native trout and char, however we are happy to fillet, vacuum seal, freeze and pack an airline approved#25 box of salmon fillets for each fishing guest who wishes to take home and share a taste of Alaska. Our season begins in mid-June as the mighty King Salmon arrive in the clearwater streams on the Alaska Peninsula. Action is hot for delicious Sockeye Salmon as well as colorful Arctic Char, Dolly Varden and incredible Rainbow Trout all summer long. You won’t find a finer clear-water sport fishing river than our home river at Wildman Lake Lodge. Crystal-Clear water everyday, guaranteed, rain or shine! Mid July brings scrappy Chum and Pink Salmon followed by Coho which begin their run in August. Wildman offers all five species of Pacific Salmon during Reel Smokin’ Salmon. This 7 day – 7 night Fishing Package Includes: A scenic direct flight from Anchorage to Wildman Lake Lodge, and return, plus: Three Fly out fishing days to neighboring rivers and four days of guided fishing via jet boat on Alaska’s only true artesian sport fishing river system for salmon, trout and Arctic char. We like to include bear viewing, walrus watching and beachcombing in every fishing week. Fly rod rental is now available: $20/day or $80/week. The lodge furnishes spin fishing gear and fly fishing equipment is available for rent. In the spirit of conservation we catch and release our native trout and char, however we are happy to fillet, vacuum seal, freeze and pack an airline approved box of salmon fillets for each fishing guest who wishes to take a taste of Alaska home to share with family & friends. This package includes: The scenic, direct flight from Anchorage to Wildman Lake Lodge, and return, all meals & lodging, lodge spin fishing gear, fish cleaning, vacuum packing, freezing and travel box, three (3) days guided fly out days and four (4) days guided fishing via Jet Boat on the incredible Wildman artesian river system. This is a boutique fishing week, with a maximum of 12 guests enjoying this spacious lodge. Private ensuite bath and shower for every room, King and twin bed options available. Enjoy Alaska’s finest clear-water fly fishing for wild, native rainbow trout, bright scrappy Arctic char and steelhead in Alaska’s only gin-clear artesian sport fishing river. Like nowhere else on the planet, our home river is fed from undergound passages originating beneath Mt. Veniaminof, an 8,000 ft volcano just 15 miles from Wildman Lake Lodge. Millions and millions of gallons of crystal-clear spring water flowing past our lodge are home to native Rainbow and the prefered destination for astonishing numbers of Arctic Char, Dolly Varden and Steelhead. Here, high or muddy water simply do not exist, making it the most reliable fly fishing river in Alaska. FISH LIKE A WILDMAN, during the Alaska SILVER STRIKE! 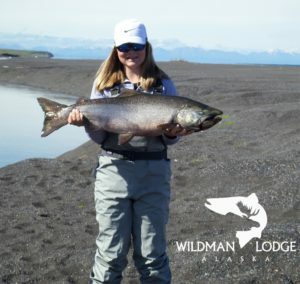 Enjoy Alaska’s hottest Coho action, luxury accommodations and gourmet meals at Wildman Lake Lodge. We are fishing for dime bright Silver Salmon, as seen on our fishing videos. Arriving in mid August and running right into the month of October, these screaming silver bullets can be taken on top water or wet flies and spoons or spinners. Every one, a fight of a lifetime. We will also be catching colorful Arctic Char and Dolly Varden and plenty of wild native rainbow trout. All can be taken on wet and dry flies. 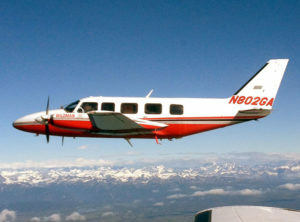 The direct flight from Anchorage to Wildman Lake Lodge and return, (a $1,500 value) all meals & lodging, Twin rooms or King rooms for couples, lodge spin fishing gear, fish cleaning, vacuum packing, freezing and travel box, three (3) days guided fly out fishing and four (4) days guided fishing via Jet Boat on the incredible Wildman artesian river system and Walrus Tour. WILDMAN WING SHOOTING and sport fishing with the experienced Wildman guides: two days & nights at our NEW Ilnik River Cabin for Coho fishing or wing shooting, plus three (3) days guided local fishing or wingshooting via Jet Boat on our extensive local river system. Available Species: Silver Salmon, Rainbow Trout and Arctic Char and Dolly Varden, puddle ducks, sea ducks and willow ptarmigan. Fly Rod and Shotgun Rental and shot shells are available at the lodge. This trip has been featured on several Outdoor TV shows and numerous wing shooting magazine articles. Limited openings so book early for this Cast & Blast. August Cast & Blast – Sunday to Saturday – Ask about our weeks during the Willow Ptarmigan season and combined with fishing for Red, Chum, Pink & Silver Salmon, Arctic Char & Rainbow Trout. September Cast & Blast – Sunday to Saturday – Include Waterfowl In September and October. Combine: Willow Ptarmigan, Waterfowl, Silver Salmon, Arctic Char & Rainbow Trout. Waterfowl Species: Sea Ducks, Common Ducks, Dark Geese, Brandt. Limited Openings: Plan your Cast & Blast vacation with Wildman Lake Lodge soon! Silver Strike begins in mid-August and continues through the first week of October. Your trip begins Sunday morning with a direct flight from Anchorage to Wildman Lake Lodge. This scenic 2 hour flight takes you across Cook Inlet and the volcano dotted Alaska Range, through Lake Clark and Katmai National Parks and the length of the Alaska Peninsula Wildlife Refuge. Wing shooting for Alaska’s Willow Ptarmigan is available. All spin fishing equipment is included and fly rod and shotgun rental is available at the lodge fly shop. Your adventure begins at Anchorage’s downtown airport, Merrill Field. Check in at 7:15 AM at Lake Clark Air, one of Alaska’s oldest and most trusted air carriers. This scenic flight takes you through the majestic Alaska Mountain Range, through both Lake Clark and Katmai National Parks, then along the Alaska Peninsula Wildlife Refuge to Wildman Lake Lodge. Have your camera ready for bear, moose, snow-capped mountain peaks and glacier shrouded volcanoes along the way to Wildman, one of Alaska’s most remote wilderness lodges, situated at the base of 8,000 foot glacier- shrouded Mt. Veniaminof, the largest active volcano on the remote Alaska Peninsula. 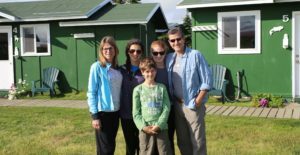 Wildman Lodge is owned by life-long Alaskan’s Butch & Kathy King and is the only facility in the area. This comfortable Alaska lodge sets among three crystal-clear artesian rivers, where during late July and early August, tens of thousands of spawning salmon attract scores of wild Alaska Brown Bear providing incredible photographic opportunities, all accessible from the lodge by jet boat. You will also fly out with our experienced lodge pilots, landing on the black sand Bering Sea beaches to spend the day viewing huge Pacific Walrus, up close and personal. We have three action packed days planned for you, including Bear Viewing and Jet boat birding, beach combing with a hearty campfire lunch along the Bering Sea coastline. You will see a part of Alaska that very few Alaskans have seen. 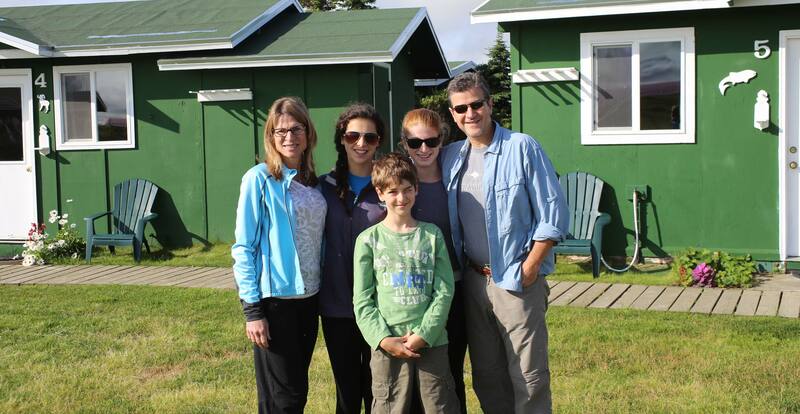 Family Packages: Family Cabins are available with special pricing for kids and teens. Eight persons maximum group size, two groups per session maximum. This is the perfect exclusive wilderness wildlife tour for families, couples or small groups. Our all inclusive package Includes: Scenic round trip flight from Anchorage, Alaska. This flight takes you southwest, through both Lake Clark and Katmai National Parks, along the Alaska Peninsula Wildlife Refuge to Wildman Lake Lodge. Have your camera ready for glaciers, smokin’ volcanos and wildlife along the way. Enjoy Gourmet Meals & Deluxe Lodging. Visit the artesian source of Ocean River, Alaska only true artesian sport fishing river and learn the wonders of the newly discovered ancient Alutiiq village at its headwaters, all in your first afternoon at Wildman Lake Lodge. Then a fully guided fly out walrus and brown bear viewing day and Volcano and glacier tour, Your next day is an exciting jet boat tour which takes you down Ocean River, along the Bering Sea intercostal waterway to a secret artesian river and spawning grounds to thousands of sockeye salmon. You will see hundreds of different bird species along the way and experience incredible brown bear viewing at the artesian springs. On our way back up river, we will stop for some excellent beachcombing along the black sand coastline of the Bering Sea and a delicious campfire salmon bake lunch. Make it a family vacation that they will never forget! Package Includes: Incredible scenic round trip flight from Anchorage through Lake Clark and Katmai National Parks, passing towering glacier shrouded volcanoes and the Alaska Peninsula Wildlife Refuge on the way to Wildman Lake Lodge. Price is based upon two persons per party, double occupancy, King Beds are available for couples, and private bathrooms in all cabins. 4 Day Package: Explore Alaska’s only pure artesian sport fishing river. Ocean river flows crystal-clear 365 days of the year, so every day is a fishing day for huge Arctic Char, colorful Dolly Varden, Scrappy Native Rainbow and Wild Alaska salmon. Includes: Outstanding meals prepared by our lodge chef, deluxe lodging and 3-1/2 days of guided fishing via jet boat on Alaska’s most pristine sport fishing river, for Salmon, Trout and Char. All meals & lodging, Twin or King rooms for couples as available, lodge spin fishing gear, fish cleaning, vacuum packing, freezing one airline approved travel box per person. 3 Day Package: Explore Alaska’s only pure artesian sport fishing river. Ocean river flows crystal-clear 365 days of the year, so every day is a fishing day for huge Arctic Char, colorful Dolly Varden, Scrappy Native Rainbow and Wild Alaska salmon. Includes: Outstanding meals prepared by our lodge chef, deluxe lodging and 2-1/2 days of guided fishing via jet boat on Alaska’s most pristine sport fishing river, for Salmon, Trout and Char. WILDMAN’S Group Reservation Booking Make your Group Reservation here with just one credit card transaction. This will hold your space and your receipt is immediate. Contact us by email with the exact week requested and number of persons in your group. We will email you a Group Booking Agreement to confirm your group reservation. Thank you. This is the package you have been discussing with Wildman!